It is a well know fact that 90% of the oceans are still yet to be explored. 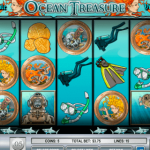 In Ocean Treasure you understand that exploring those waters can be very lucrative. Of course your goal is to find those treasures but did you ever also wonder if mystical creatures really do exist? Here’s your chance to find out! The Wild in this game is the Puffer Fish symbol which will substitute other symbol to create a winning combination. There are also two scatters here. The first one is the Compass symbol. 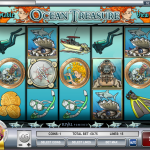 Landind 3, or more anywhere on the reels will reward you with 10 Free Spins. 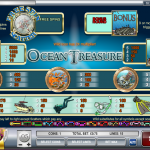 The multiplier for those wins is 3x with a chance to re-trigger the Free Spins when landing more scatters. The second scatter is the Open Oyster & Shark symbol. Landing 3 or more will trigger the Bonus Round in which you’ll be picking oysters. Each will give you a nice prize.